Our most popular Leaning Post model is equipped with four stainless steel rod holders and works well on boats 21 ft. & larger. 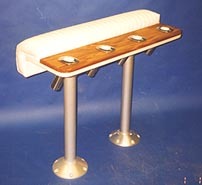 Pedestals may be attached at any dimension to accommodate your hatch or deck configurations - all hardware is provided. Offering all the same features. Our LPR-36 is the perfect choice for smaller boats and remember we are always available to fabricate any custom size. Colors, pure white, off white & Light gray. Call for custom colors. This Leaning Post offers the same features as our LPR-40 & 36in. models, but comes with a deeper cushion for extra comfort when sitting as well as standing. Drop in removable backrests in matching upholstery are available for our LPR-40, LPR-36 & LPR-20 models. Great for extra comfort! The perfect choice when replacing only one seat - also great for fly bridge application. Our 20 in X 13in.D dimension easily replaces any single helmseat and again custom sizes are always available.. Colors, Pure white, Off white or Light gray. Call for custom colors. The perfect choice when you want to replace one of your center console seats with a leaning post for yourself while leaving a regular seat for your passenger. With this unit you also get two extra rod holders and our optional drop in back rest is also available. Colors, Pure white, Off white, & Light gray. Call for custom colors. Stainless steel handles as pictured are available for all leaning post models. Let me say at first when I ordered my custom leaning post online I was a little nervous to say the least. However, when I opened the box and unpacked it I just stood there for 15 minutes staring at the masterpiece you built. Thank you so much. This will only highlight the beauty of my Classic 1979 Mako C.C. Just a quick note to thank you for tremendous service. I faxed an order on Tuesday morning and it arrived at my house Wednesday afternoon, unbelievable. I couldn't get it that fast if I drove down after it. In the days of "customer beware" your company is a breath of fresh air. Both single and double width models are available with or without stainless steel rod holders as shown. $1,195.00 (40-LPRT) Optional teakwood frames are available 20', 26' and 40-inch rod holder models as shown. These ruggedly constructed posts adapt to all existing helmseat pedestals by using our slide over system or may be ordered with their own permanently mounted anodized aluminum pedestals. These leaning posts are fabricated with maintenance-free polyethylene frames, double stitched marine grade vinyl and stainless steel fasteners. convenience. Model shown is 36 inches wide and optional sizes are always available. White, off white cream or grey are stock colors or choose your own vinyl or material. Manufactured on Starboard inner frames. Model No. SBS-2L $1,695.00 including adj. hgt. pedestals. Protect your leaning post and Leaning post with rod holders from the weather and the sun with our NEW covers.